You can order a signed copy directly from Karen's restaurant, the Fish House Also available from Amazon.com, Amazon Canada and Amazon UK or from your local bookstore. In our image conscious society, the low-carb craze is omnipresent. In fact, low-carb isn't just a diet anymore-it's a lifestyle. Yet current low-carb cookbooks offer only standard, follow-the-plan recipes. None take the innovative “food-as-pleasure” approach that only a trained restaurant chef-and low-carb weight-loss success story-can offer. 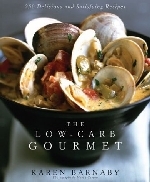 With over 250 easy-to-prepare dishes, from simple to sophisticated, The Low-Carb Gourmet is for food lovers who enjoy preparing delicious meals that follow low-carb principles. Try Chicory with Hot Pancetta Dressing, Thai BBQ Chicken and German Chocolate Cake. More than a cookbook, The Low-Carb Gourmet features tips on living the low-carb lifestyle, including meal planning, grocery shopping and entertaining. This is a terrific addition to any kitchen, even for those not following the Atkins or the South Beach diets. Simply put, The Low-Carb Gourmet sets a new standard in pleasurable, healthy eating. Karen Barnaby has been a professional chef for over 25 years. She is the author of Pacific Passions and Screamingly Good Food, a Cuisine Canada Silver Medal winner. She is also co-author of the Girls Who Dish series and two David Wood cookbooks. Teaching herself to think outside the “bread box,” Karen lost 70 pounds on a low-carb regimen, improving her health, energy and confidence. Her career started in 1978 on a four-burner, pink electric stove in the basement of an Ottawa restaurant. She’s held the Executive Chef position at Fish House in Stanley Park since 1995. In 1999, Karen realized that she had to do something to change her health. After 8 months of being on a low-fat regime with virtually no results, Karen read the book Protein Power and it changed the course of her life. Low-carbing wasn’t easy as a restaurant chef but persistence paid off. Teaching herself to think outside the “bread box,” She’s 70 pounds lighter and her health is better than ever. If she can do it with temptation everywhere, she believes that anyone who wants to change their health can! Sushi without rice, pizza without dough and bread pudding without bread? Barnaby provides recipes for all the gourmet treats that low-carb dieters crave. Though starch-lovers might find the To-Frites chewy and unsatisfying, they’re not bad as long as they’re thought of as fried spiced tofu and not as French fries. Many of the recipes are like this: great on their own, but a poor substitute for whatever they might be trying to be. The ones that stand out are those that could be found in the protein section of any carb-laden cookbook: Salmon Steaks with Ginger Butter, Slow-Roasted Spice-Cured Pork Shoulder, Winter Vegetable Soup. Barnaby does include multiple recipes for vegetables reborn in a low-carb world: rutabagas, kohlrabi, chayote, daikon, cauliflower and kale find their niche in butter and cream sauces, or disguised as rice, mashed potatoes and pasta. The low-carb eater will welcome the salad and vegetable sections as defense against the idea that low-carb diets are all about steaks and bacon. Snacks are also strong, with delicious Five-spice Sesame Walnuts and scary but familiar Crispy Chicken Skin. The dessert section includes a discussion of possible artificial sweeteners, Splenda being the most recommended. Many of the desserts are surprisingly tasty. With Splenda and almond meal in place of flour, the New York Cheesecake is as good as a more traditional cake. The growing number of low-carb dieters seeking to cook food that even their carb-chowing friends will appreciate will welcome this book, but, as many of the recipes are high in fat and odd for the traditional palate, it is unlikely to lure people to the diet. Karen Barnaby is the executive chef at the award-winning Fish House restaurant in Vancouver. The author of five previous cookbooks, she lives in Vancouver, B.C., in Canada. "Cook well. Eat well. That's always been my philosophy," Karen Barnaby says. "I've just translated it into low-carbing." Anyone who is currently on-or contemplating embarking upon-one of the many low-carb diets will find The Low-Carb Gourmet to be a goldmine of recipes, tips, and inspiration. The first sophisticated low-carb cookbook on the market from acclaimed chef Karen Barnaby, who has lost 70 pounds through low-carb eating. Over the past few years, low-carb high-protein diets have changed the way America eats. But how much steak, bacon, and cheese can a person eat? Low-carbers have been looking for a cookbook that will give them the variety, sophistication, and sublime taste sensations that the true food lover craves-and yet will allow them to reap the weight-loss and health benefits of low-carb eating. advice on meal planning for special occasions. Karen Barnaby, known to our web visitors through her Gourmet Low-Carb Recipes, has been interviewed numerous times by the media. Always eager to share her story, she hopes to inspire by example. She firmly believes that if she can do it as a restaurant chef, anyone willing to change the course of their health can do it too. When food is your livelihood, how do you keep from getting fat? NOW we have arrived: "Heinz to launch low-carb Ketchup"
Karen on our local papers - Who said low-carb has to taste lousy? Karen was on the forefront of the low-carb movement. A low-carber since 1999, she started the Low-Carb Dinner Series in 2002 at the Fish House in Stanley Park. These special dinners featured the food and cooking of a different country each time. 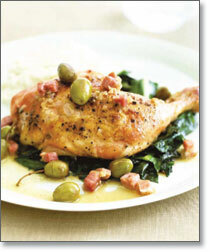 The dinners ranged from Thai to Italian, showing that low-carbing was indeed adaptable to the flavours of any cuisine. Now the Fish House in Stanley Park offers a permanent Low-Carb Content in addition to the regular menu offerings.